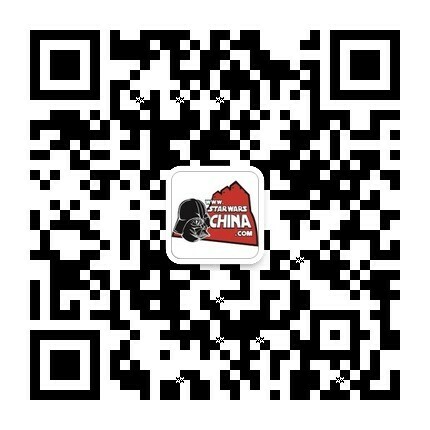 ﻿﻿ 机器人炮艇（droid gunship） - Databank - 星球大战中文网 Star Wars China - Powered by Discuz! 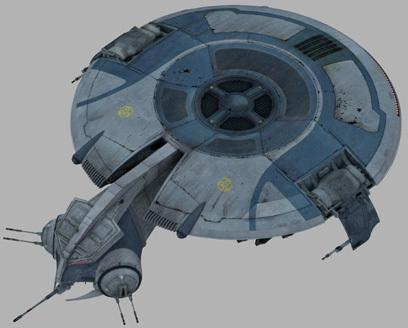 The Confederacy developed this dish-shaped droid gunship in response to the victories won by the powerful Republic attack gunship during the Clone Wars. The atmospheric vehicle's flat underbelly is lined with ordnance pods, capable of unleashing rockets and bombs at distant targets. Its forward nose is packed with laser weaponry, including twin turrets each carrying two laser cannons, and a powerful forward-facing cannon. Each wingtip also carries a laser cannon. 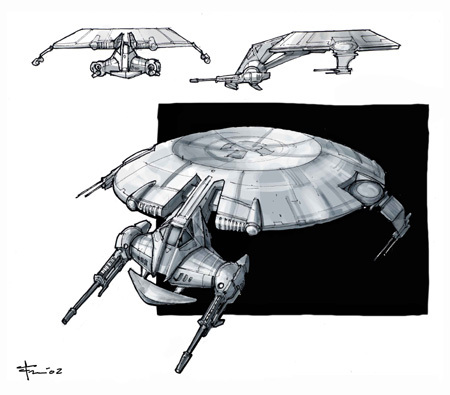 The design of the droid gunship stems from the saucer shapes used in the development of the Trade Federation vessels seen in Episode I. At one point, these droids were to be seen during the opening space battle of Episode III before they were ultimately deemed to be atmospheric craft seen during the Battle of Kashyyyk.